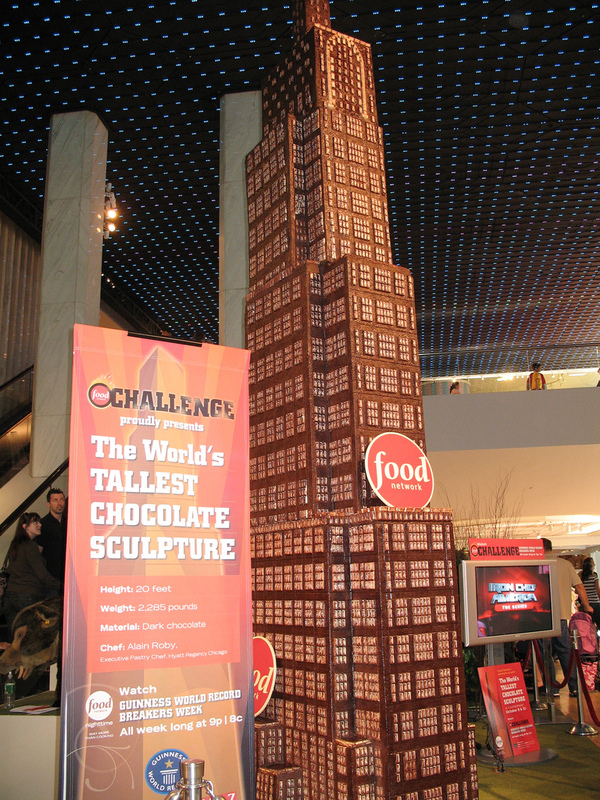 This chocolaty architectural creation went into the Guinness Book of World Records for being the tallest chocolate sculpture at 20 feet 8 inches or roughly 6.3 meters. 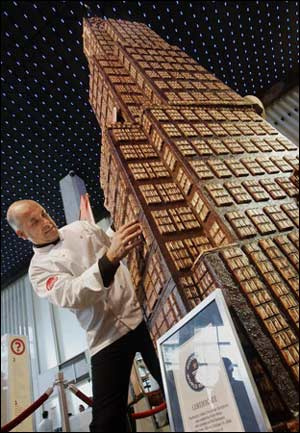 French chef Alain Roby, the creator of this delicious skyscraper, mentioned the building consist of designs from the Empire State Building, Rockefeller Center and the Chrysler Building. The entire building weighs a staggering 1036 kilograms which is around 2285 pounds of dark and white chocolate. 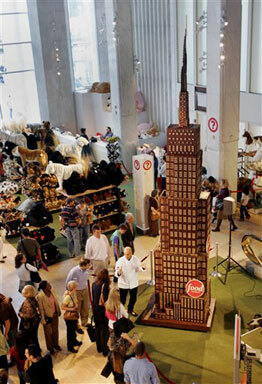 This world record piece was located in New York's famous FAO Schwarz toy store. In the video, the crew really struggled to lift the weighty chocolate building blocks. The incredible weight is evident to the point where the chef himself appeared to be sweating heavily from the strenuous effort required. I wonder how this massive chocolate structure was handled afterward when it started melting. Alain Roby himself is a senior executive pastry chef of the Chicago based firm, Hyatt Regency. Haha, I'll have a room in the penthouse 'sweet'! my goodness... i'd like to bite into that! I just want to eat it!